During the torturous end to Jose Mourinho’s United reign Scott McTominay was damned by association. He was considered a pawn in Mourinho’s games, used as an example to tell some of United’s star men exactly where they were going wrong. With Mourinho gone many expected McTominay to follow, off to the lower echelons of the Championship. It would be interesting to hear exactly what McTominay made of his treatment from Mourinho one day, but since the Portuguese has left instead of drifting away to the margins of this squad he’s convinced a second United manager of his strengths, and they are many. He’s been trusted in some of United’s bigger games over the past couple of seasons and with Ander Herrera and Nemanja Matic absent against Barcelona, it was no shock to see him in the side. He might have been included had those two been fit. 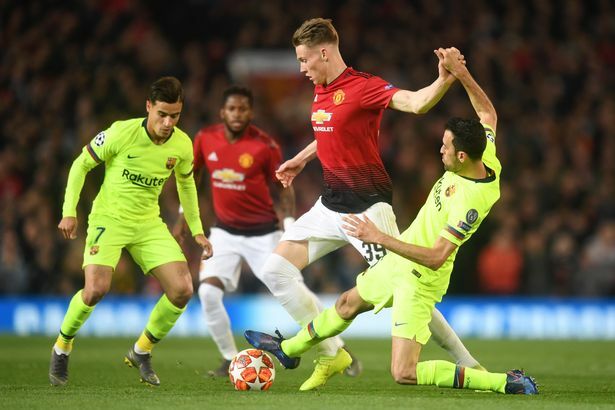 It was McTominay who controlled the midfield for United, his industry and intelligence outshining £89million Paul Pogba and £52million Fred. Make no mistake, McTominay belongs in this squad, and not just on the fringes. He earned Mourinho’s trust, now he’s earned Solskjaer’s, and as Old Trafford briefly sang his name against Barcelona, it became clear he’s earning the backing of the fans as well. A bright future awaits. 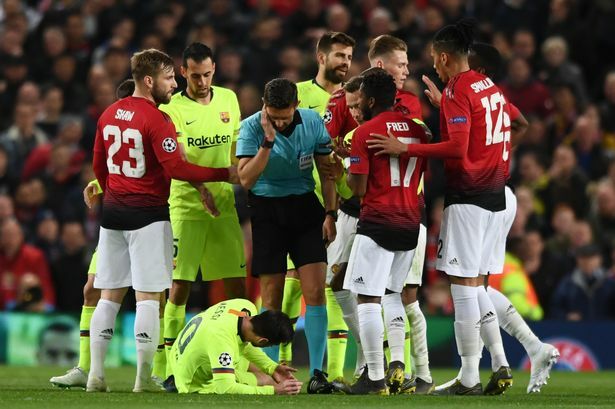 On Tuesday Solskjaer explained how much his side had learnt since the first leg against Paris Saint-Germain and that they’d be better prepared for some of the dark arts that Barcelona might bring to Old Trafford this time around. “Some of these players will have some tricks up their sleeves, streetwise players,” he said of the visitors. Sergio Busquets certainly ticks that box. He committed at least three fouls worthy of a yellow card in the first half, yet somehow only got booked for one. That’s streetwise. There was a slight naivety about United too, however. 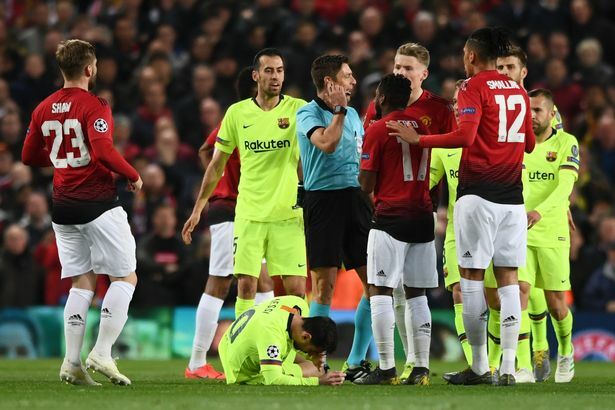 After his booking for pulling back Pogba they should have been in referee Gianluca Rocchi’s ear every time he committed a foul from then on, reminding the Italian official that Barcelona’s midfielder was totting up the fouls. Instead they let him get on with it and made it easy for Rocchi to keep him on the pitch, when he should have walked before the break. Thanks to his first-half booking Luke Shaw will now miss United’s next three games, having picked up a two-game Premier League ban for collecting 10 bookings this season. It gives Solskjaer a headache for the domestic fixtures against West Ham and Everton and next week’s Nou Camp return. United are short of cover and competition for Shaw and it might be that Marcos Rojo comes in from the cold, unless Dalot is pressed into an unfamiliar left-back role. Either way it shows Solskjaer that he needs someone to battle with Shaw at left-back next season. Forget Aaron Wan-Bissaka, it’s on the other side of defence where United’s more pressing issue lies. Rojo isn’t the answer. The concern is that might be spelt out starkly over the next three games. The surprise side Solskjaer selected against Barcelona was a nod to the Paris heroes who made this tie possible for United. Nine of the XI who started at the Parc des Princes were back in action at Old Trafford. In midfield Pogba came in for Andreas Pereira, a move Solskjaer had to make, while Dalot replaced Eric Bailly, something he did after just 36 minutes in Paris. This may have been a coincidence but it certainly showed the stars of the show in Paris have earned Solskjaer’s faith and trust. It’s hard to argue against the idea that this team would have been strengthened by the inclusion of Jesse Lingard and Anthony Martial, however. At 31 the chances to see Messi at his peak are beginning to run out, so you can understand the fascination every time he plays in England. But BT Sport showing live coverage of his warm-up on social media seemed to take the fawning to new levels. If they were looking for insight all it revealed was that he stretches in the exact same way as his teammates, and generally seems to save his levels of genius for when the whistle blows. The one moment the Messi cam might have come into its own was when Chris Smalling clattered him midway through the first half, leaving Messi looking like he’d just sparred with Tyson Fury, watching on from the directors box. The Argentine was left bloodied and battered by the challenge, but it didn’t inspire him to demonstrate his greatness to Old Trafford. His wait for a goal here goes on and as Old Trafford chanted ‘Viva Ronaldo’ while Messi had his face patched up, it was clear where he stands in these parts in the great debate over the game’s two big stars.